As a Fashion Photographer, there are often when you have sudden bursts of inspiration, and come up with the idea that feels monumental. The challenge then becomes holding on to this idea until you can execute it. Far too many ideas are lost in this transition, just because you become overwhelmed by the idea of planning out your shoots. Below, we give you a few simple tips and steps to get you started with planning your fashion photoshoot, to make sure your ideas make it out of your head. Mood boards: Mood boards are a great way to put together everything that seems even remotely related to your idea. This can be colour palettes, makeup, outfits, settings, lighting, environment, or anything in between. Your mood board is a visual representation of the themes and idea that you have in mind, and are the starting point based on which you carry forth your shoot. Often, they can also help you share your ideas with your clients or models. Sharing mood boards and letting them add to it with their contributions can be an excellent way to develop mutual understanding and bonding. Mood boards can also revolve around specific models or outfits. 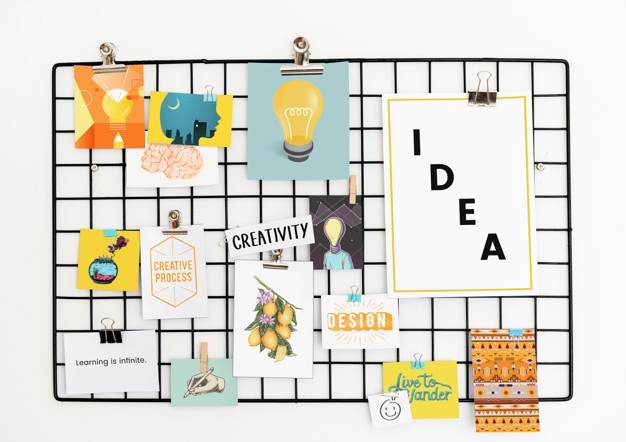 Since they are mostly a way to gather your thoughts and ideas, there are no strict rules about making your mood board. While a lot of people turn to Pinterest, you could use any platform, medium, and method for making your board. Journal: Keeping a sketchbook, notepad, or journal on you at all times can be a great way to record any bursts of inspiration or ideas that might strike you throughout your day. Inspiration can come from any source or moment of your day, and it can be beneficial to record all these thoughts and come back to them later to develop them further. What you record becomes entirely up to you, and can range from doodles, words, and phrases, to entire paragraphs, stories, and live to sketch. The journal should be your method of creative expression. This can be specifically helpful for people who tend to forget things very fast. Preparing the models: Your brilliant plan and vision will never take off if the people involved in the shoot are not committed and fully aware of what they are supposed to work on. Even though your ideas may seem complicated and hard to explain to a person who doesn’t know your brain, communication is vital, especially in the case of passionate and creative projects. Make sure you inform the models, and all the people involved in the shoot, well in advance about what to expect and how they should prepare themselves for the shoot. It can also help if you sit down and have conversations with them as a trust-building exercise during the shoot. Remember that your ideas are only as good as the way they are executed, which means a lot is riding on the people who are assisting you in the execution. Fine details: Once you have the initial idea and the models figured out, you will have to set your mind to establish the place, time, and date for your shoot. This is important information that you will have to convey to all the people involved in the shoot. It is a good idea to be very strict with time to ensure your entire timeline is adhered to. Moreover, the decision regarding location is, and you will have to decide a lot of your shoot details based on where you plan to hold it. Make sure you have a good understanding of the location and all the challenges you could face while working there. Brief the models and crew about what environment they’ll be stepping into and the best way to prepare for it. In the case of studios, check your lighting and make sure your equipment is spot on. Hopefully, these are the points to get you started on translating your thoughts and visions from your head into actual executable plans. Do let us know how they turn out! Good luck and happy shooting! What should I bring to a photoshoot model?